Choose the one that helps the most & fits you best! It’s important that our annual dues remain affordable to all our members, and, despite the rising cost of just about everything, your Board is holding the line on dues this year — but that means reducing our ability to make continued progress in Security, Responsible Development, Street Repair & Improvement, Legal Defense, our Junta Vecinal and our quest for Visto Bueno. Obviously, we have to lower our sights and do less…or raise enough pesos to keep making progress another way. We hope, with your help, it’s the latter. For those who can afford to help us cover the costs of continued progress, we’re offering three new levels of membership and support. As well as the familiar ‘Basic’ membership, we’re offering ‘Amapas Protector’, ‘Amapas Guardian’, and ‘Amapas Visionary’ memberships at higher levels of financial support and greater public recognition. BASIC MEMBERSHIP is still $1,500 pesos = $100 USD for individuals and $1,300/unit for Full Building Members. You have a vote at our Annual Meeting; receive our monthly Newsletters, announcements & invitations to ANA events via email; and each member of your household gets a membership card, which entitles them all to Member Benefits discounts at ANA Sponsors and other participating businesses and restaurants (check our website’s ‘Benefits’ tab for a current list). AMAPAS PROTECTOR at $2,500 pesos, you ‘double down’ on your support for ANA goals and projects. You have all the rights and benefits that come with a Basic Membership, and you’ll be recognized on a special page of the ANA website as an Amapas Protector. 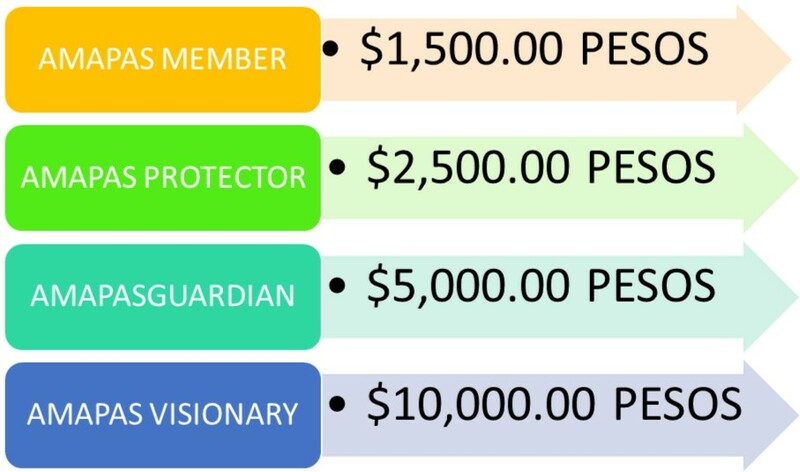 AMAPAS GUARDIAN at $5,000 pesos, you’ve gone beyond the call of duty, and into the ranks of real leadership. You have all the rights and benefits that come with a Basic Membership. You can choose to remain anonymous, but we’d like to recognize your generous level of support on a special page of the ANA website as an Amapas Guardian. AMAPAS VISIONARY at $10,000 pesos, you not only see the bright future Amapas can have, but your strong support helps us reach it. You have all the rights and benefits that come with a Basic Membership, and may choose to remain anonymous, but we’d like to recognize your high level generosity and commitment on a special page on the ANA website as a true Amapas Visionary. You can upgrade your membership to a higher level at any time. If you join or renew at one level, you can easily step up to a higher level of membership support later. And you don’t have to start over; just add the appropriate amount to the value of your current membership level. So, for example, if you joined or renewed at the Basic level ($1,500 pesos), stepping up to Amapas Protector ($2,500) would mean an additional $1,000 pesos. If you’re a Basic Full Building Member ($1,300 pesos), stepping up to Amapas Protector would mean an additional $1,200 pesos. We value your support, and want to recognize your generosity publicly, so any other contribution you’ve made to the ANA during the year is part of our calculation. For example, you can become an ‘Amapas Visionary’ through your choice of membership level alone, or a combination of membership and contributions to our fund-raising efforts. To become a voting member of the Amapas Neighborhood Association, you must be a resident of Colonia Amapas or Ampas Sur, or owner of a business located in this neighborhood, and over age 18, to join the ANA. Not sure you’re in Amapas? Check the maps on this page. Step #3: click on SUBMIT SECURE PAYMENT and fill in requested credit card information. Important: Name, address and telephone must match what your bank has on file or your payment will be rejected. No information about your credit card number is retained. You will be sent a receipt by email almost immediately upon approval. As Casa Cupula is providing this service at no charge to ANA, your receipt will be from them. Step #4: Forward your email receipt PLUS please add your local PV phone number(s), building name, condo number, and address (one membership allowed per household) to the ANA secretary at ( admin@amapaspv.com ) as PROOF OF PAYMENT. If you would like to contribute via cash or Mexican check, visit our ANA Administrator Viviana Testón at our desk inside the Ron Morgan Properties Office located on Olas Altas 509; office hours are monday through friday 11-5p.m. and saturday mornings. Call in advance to set up an appointment. Please make checks out to: Asociacion de Vecinos de la Colonia Amapas, A.C.